Can you please post an image of a hidden egg bundle in an island? I have no idea what to look for. It is a big golden egg. I have only seen one a day so far. Try clicking on the floating people between islands! Often the eggs are hidden behind them! What I’ve found helped tremendously in finding the egg in this and previous egg hunts, is go into Edit Path mode. It makes everything in your park more translucent, and you can see behind/through decorations and habitats. Once you find the Golden Egg, turn off Edit Path and click where you saw it, even if it was hidden behind something! Hope that helps! Got a clear screenshot, how can I post it? Try this, click on one of your path pieces so that everything else fades and becomes see through. The eggs will be the only thing (other than the paths of course) that will still be perfectly visible. Works perfect for those hidden ones behind habitats and what not. These dragons can be bred using the co-op breeding cave. If any friend has one up you can put up any epic of your own and have a chance of getting it. I’ve heard that the breeding chances are pretty good, and also that the Monolith 5 dragon has a better “fail” chance than other types. Good luch breeders! Has anyone managed to get a hold of the Chrysalis? I have a friend whose chrysalis is in co op. 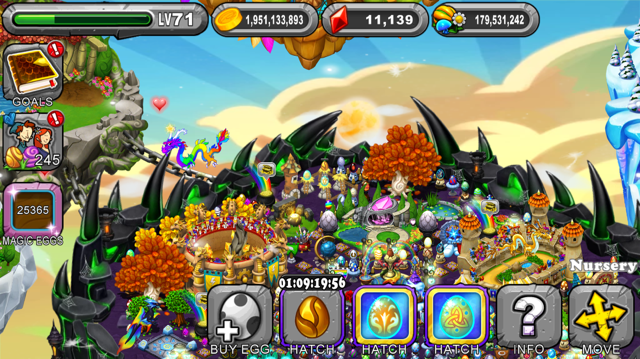 Which is the best dragon I should breed with it to get a Chrysalis? For the egg hunts you have to zoom into each island and look around and you’ll find more than one huge egg. Also I’ve found that if you wait until the treasure chest is above your dragons habitats there is sometimes eggs hidden there. I would suggest just keeping a dragon in the Barac-whatever-it-is, arena and let them get you eggs. Where do I get a chrysalis habitat ? I can’t put my baby in my christaline habitat. I bought the baby chrysalis from the egg hunt. Is it still possible to get a Chrysalis and if so how. I cannot breed Swallowtails or Duskwings.